We experience lots of “perfect” moments under the specific conditions that exist at a particular time. Let’s call that contingent perfection. Under the circumstances, that was “perfect!” The event was as good as we could have hoped for it to be. A fairly recent phenomenon, as I’ve gone out to restaurants or talked with someone at a call center, is to hear an enthusiastic voice deem whatever I’ve said as, “perfect!” Whether it’s my choice from the menu or simply the answer to a question like, “What’s your address,” my answer is “perfect” according to various service providers. Can all moments be perfect in some aspect? At the end of The Last Samurai, Katsumoto’s dying words proclaim, “They’re all perfect!” In Japan, cherry blossoms represent the fleeting nature of reality—how precious and beautiful things come into being and then so quickly pass away. In Japanese aesthetics, the expression for this bitter-sweet reality is mono no aware. Katsumoto grasps that many, if not all, of the moments of his life, like the cherry blossoms, were perfect—even if contingent and fleeting. In the West, philosophy and theology has inherited a Greek notion of perfection that suggests completeness—something which lacks nothing. The Supreme Being is necessarily and permanently perfect. It’s final. But is God ever really finished? What if God is the culmination of the entire story of creation? This leads to the idea that there can be a fleeting and contingent perfection in addition to the idea of permanent and necessary perfection. Theological mistakes have been made based on the Greek idea of perfection. Some people think that it would be demeaning to suggest any limits to the divine attributes. For example, the perfect being—in its completeness—would be omniscient in the largest absolute sense of the word by knowing the future as well as the past. It’s difficult to reconcile genuine free will with this view. In some sense, the world of absolute omniscience plays out before it even happens, but life doesn’t feel that way, and much of the Bible suggests a God waiting to see what we’ll decide and then responding accordingly. In this view, the perfect being would also be omnipotent, having complete power—all the power. If God has all of the power, however, creatures cannot have any. If I have no power, I cannot choose. I cannot act. The problem of evil arises to challenge a God who has absolute power and goodness but does not intervene in horrible, daily occurrences or the great atrocities of history. Our experience shows us that we do have power and, again, the Bible suggests that God has, at the very least, granted us the freedom to make decisions. It has also been suggested that if God is the classically perfect being, lacking nothing, God can never change. God is the necessarily perfect being from the beginning of time to the end of time. Therefore, God completely transcends the temporal world of change. If God changed, it is reasoned, what would there be to change to? If God gets better, this would suggest a previous imperfection. If God gets worse, God clearly wouldn’t be perfect anymore. God must, therefore, be perfect and stay perfect without changing. This a false dichotomy. Change, even for God, is not a simple choice between perfection or imperfection. Instead, I suggest that God has a dual nature (eternal and temporal), and there is something we could call the growing perfection of God within the temporal domain. This involves a change from perfection to greater perfection as God embraces and celebrates our contingent perfections and helps to correct our imperfections. Our metaphysical compliments paid to God through the ages suggest that God is so perfect that God doesn’t have any need to change. Who are we to limit God in this way? Is it really “perfection” to never be able to grow? Is it really perfection to never be able to experience the contingent and creative perfections of an ever-growing universe, in a new way? Perhaps we need to expand this limited, classical notion of perfection. It seems to me that the greatest perfection of the Supreme Being includes the ability to become more perfect over time in response to the expressions of a universe of creatures striving to participate in establishing their own myriad beautiful creations. It has been suggested that the classically perfect, eternally complete God is impassive as well. But if God is loving, if God is love, then God is in relationship. To be in genuine relationship with individuals with some degree of free will is to be involved in a process of changing relationship over time. God is in relationship with creatures who have their own power, however limited in comparison with the Supreme Being. Why do we have this power if not to be creative? It could, in fact, be argued that to be creative is what it means to be created in God’s image. God has given us the power to create. God has given us the power to create beautiful things. Sometimes we fall short of that beauty, but it is out of the power of personal expression, however flawed, that we have the ability to add something of value to the world. In adding something of value to the world, we are adding something of value to God, thereby adding to God’s perfection. The most perfect moments in life are moments lived in inspiration. They are moments where we live in harmony with the uncontrolling love of God. We become inspired vehicles of God’s creative love in the world. Olav Bryant Smith is a process philosopher and theologian teaching at California State University, Chico, and Butte College. He was the managing editor of Empirical magazine and is the author of Myths of the Self: Narrative Identity and Postmodern Metaphysics. 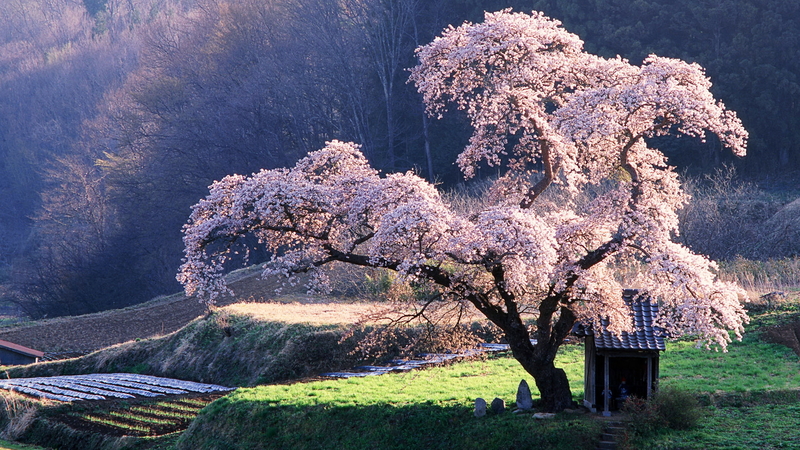 Credit for “Cherry Tree, Japan” goes to Leonid Li/Flickr. I enjoyed this well-written, easy to follow, essay. And it resonates with me (coming from a Wesleyan-holiness background). As I have been following this blog and trying to engage in what process/relational/open thinkers are saying, the thought has come to me lately, as well, that God is both changing and unchanging, both outside time and inside time. In my lay mind, God the Father is unchanging. God will always be love, always be holy, etc. God the Son’s role in entering humanity, joining God and man, certainly changed God forever. Maybe we’ve only begun to understand the incarnation and all its ramifications for God as well as for us. Surely God the Holy Spirit keeps it all in motion (“the dance” as Richard Rohr calls it) — the unchanging nature and sovereignty of God in constant relationship with the changing part of God that has joined with humanity/creation. I think we are called to live in both this perfection and this transforming/becoming/creative living.